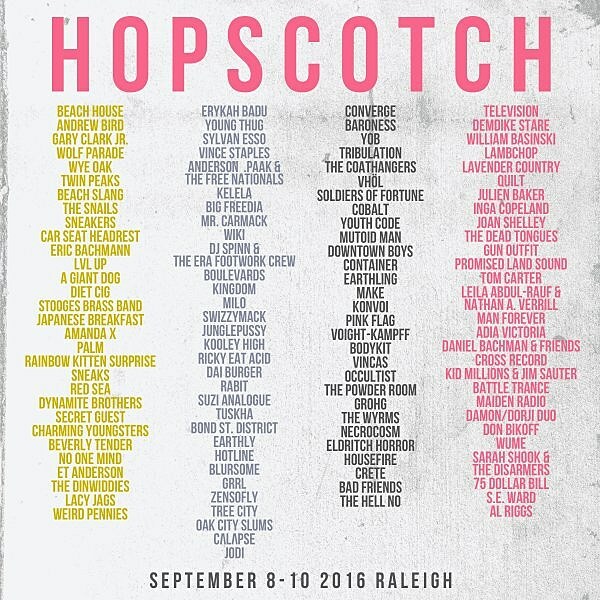 The Hopscotch Music Festival returns in 2016 to various Raleigh, NC venues from September 8-10. The lineup is impressive as always, with Television, Wolf Parade, Converge, Baroness, Yob, Tribulation, Erykah Badu, Young Thug, Sylvan Esso, Vince Staples, Anderson Paak, Beach House, Beach Slang, Andrew Bird, Cobalt, Downtown Boys, Julien Baker, Quilt, Lambchop, Lavender Country, Big Freedia, Wiki, Kelela, The Snails (members of Future Islands), Car Seat Headrest, Eric Bachmann, Japanese Breakfast and more. Tickets go on sale Thursday (5/12) at 10 AM. Check out the whole lineup on the poster above, or HERE.